1 Here’s an easy vegetable dish that you can cook over and over without getting tired of it. First, get a pot and fill it with 5 cups water. Over high heat, bring the water to a boil and drop 2 Knorr Pork Cubes. 2 Throw in the kalabasa and cook until firm but tender. Add sitaw next followed by the talong and okra. Boil the vegetables until they're just cooked. 3 Lastly, add dahon ng malunggay and that’s our dish. 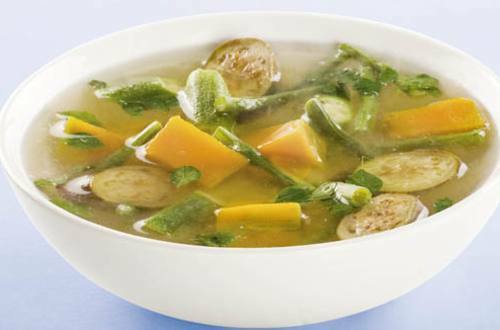 4 Match Kalabasa and Malunggay with your favourite fried dish or eat as is, you will definitely feel happier and lighter all throughout the day. Thank you mom for serving this healthy food to us!